One of my favorite images from The Book of Revelation, WOB for short, makes an appearance in Spencer’s Faerie Queene. The valiant knight, Redcrosse, physically weakened after drinking from a magic fountain that induces sluggishness, is morally compromised through fornication, physical or allegorical, not sure which, with the evil Duessa, a lady of all things false, who is disguised. He is then assaulted and nearly killed by a giant, Orgoglio, borne of Earth’s womb, who is stayed by Duessa’s entreaties, she desiring to keep the knight for her own pleasure. 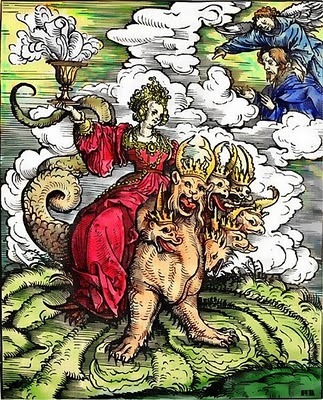 The hideous giant is much taken with Duessa, and decks her out with a seven-headed serpent that recalls the WOB, which allegorizes the Church of Rome, at least for the Protestants. And me thy worthy meed vnto thy Leman take. 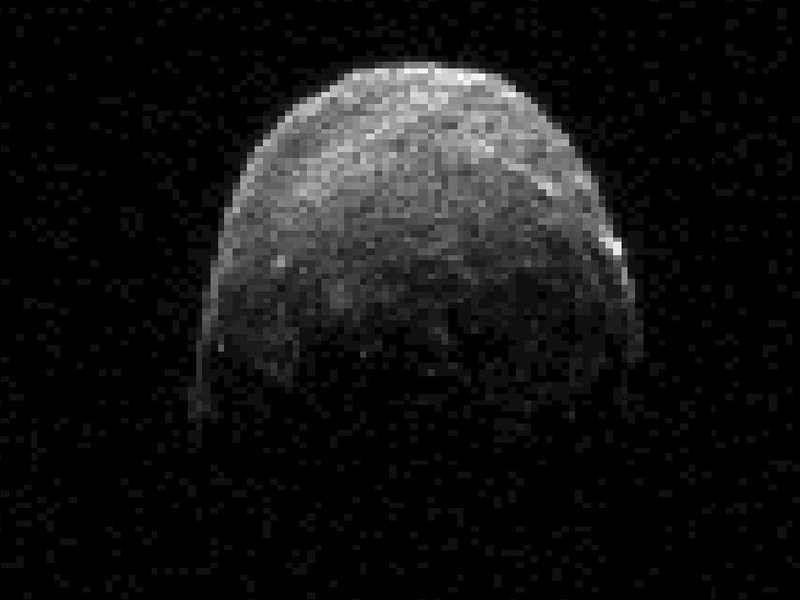 He set the false Duessa, for more aw and dread. Do we have a plan for the next one in case it’s not so ‘far’ away? Remember, watch the skies!! A Headline I Just Have to Love! Yep, that’s what the article was called! Click on the link to read it! 1970s post-nuclear apocalypse, bad sound quality, low budget, grainy images, cult status: that’s A Boy and His Dog, based on stories by Harlan Ellison. Don Johnson plays Vic, who traipses across the desert with his highly educated, cynical, and telepathic dog, Blood. The dog calls him Albert to annoy him. If you hadn’t read the story (or the Wiki article) you might think Vic is hallucinating and talking to himself, but it seems that before The End, civilization got into some pretty advanced biological experiments. Vic is trapped, lured underground by a piece of ‘cheese’, a beautiful girl (Susanne Benton), to a surviving community where things look nice, but society is ruled by a committee of three and Christian pap is pumped over loudspeakers endlessly. Vic is needed for his sperm – he’s a good, healthy specimen of a male. When he learns the reason for his abduction, he’s all for it! He doesn’t realize that the process will be rather mechanical. This movie is pretty slow, and it’s hard to watch because of the quality and low budget…but there’s something to it. Especially in the second half, it’s so crazy and darkly satirical, that it comes together. Of course, there’s that ending after Vic and the girl escape back to retrieve Blood, left topside in the desert. I won’t spoil it for you. Historically, the pine’s defense against the beetle is living where conditions are too cold for it — at high altitude or at high latitudes. But as the climate warms, that defense has failed catastrophically… The tragedy is the ongoing demise of an ecosystem, one for which humans are culpable. [the threats] include an invasive, foreign fungus and the suppression of forest fires, which are important in establishing pure stands of whitebark pine. But the most important threat is the spread of the native mountain pine beetle, which tunnels into the tree and lays its eggs under the bark. The fungus is ‘blister rust,’ introduced from Europe. Note that climate change is not directly linked to the problem, and that the threats cited are well-known, long-standing, serious, and similar to threats faced by many ecosystems today: exotic species; human intervention in the eco-dynamics; local pests. So, what do we actually know? 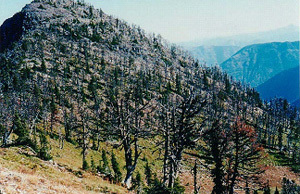 We know that the whitebark pine is important for western ecosystems. We know that the trees are dying at a great rate. We know that they are dying because of a variety of factors, several of which have nothing to do with anthropogenic climate warming (AGW), and we know that one factor, the beetles, is extremely important and that it has been encouraged by warmer winters over the last several years. The link to AGW is assumed, as usual. Climates, local and global, vary. There is no evidence that this forest catastrophe is more than a conjunction of several negative factors, several of them associated with human activity (importation of fungus, suppression of forest fires) and recent weather. Simply because the events are consistent with the hypothesis of AGW, it is automatically assumed that the proof is given, and the press goes to work. They are totally separate issues. Forest insects and pathogens are the most pervasive and important agents of disturbance in North American forests, affecting an area almost 50 times larger than fire and with an economic impact nearly five times as great. The same attributes that result in an insect herbivore being termed a “pest” predispose it to disruption by climate change, particularly global warming. Although many pest species have co-evolved relationships with forest hosts that may or may not be harmful over the long-term, the effects on these relationships may have disastrous consequences. We consider both the data and models necessary to evaluate the impacts of climate change, as well as the assessments that have been made to date. The results indicate that all aspects of insect outbreak behavior will intensify as the climate warms. This reinforces the need for more detailed monitoring and evaluations as climatic events unfold. Luckily, we are well placed to make rapid progress, using software tools, databases, and the models that are already available. The results of our examination of data and models, as well as our exploratory computer runs, indicate that if climate does warm, all aspects of insect outbreak behavior will intensify. Then End is nigh, again. 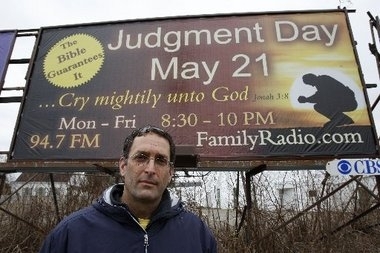 Folks, the Apocalypse is due on May 21, 2011. That’s the word from this inspired electrical engineer. Read more, if you dare, right here. The late, great scholar, Norman Cohn, had a lot of interesting things to say about the historical precedents to this. …and Love the Bomb! Also known as Dr. Strangelove. That’s Hannah Dundee gazing at Fat Man, one of the A-bombs dropped on Japan. 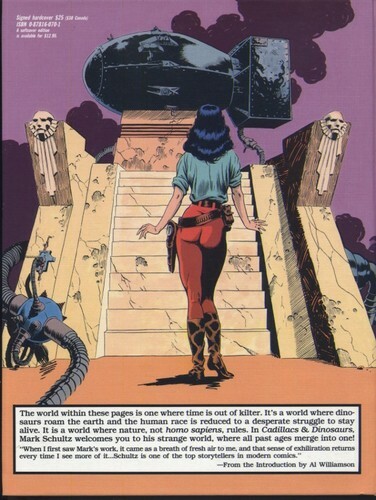 Hannah inhabits Xenozoic Tales, comic book adventure series written and drawn by Mark Schultz, who carries on the tradition of Hal Foster (Prince Valiant), E.R. Borroughs (Tarzan) and other old-fashioned comic-pulp storytellers. The macho hero is Jack Terenc, a shaman of sorts who tries to keep civilization in balance with nature so that The Great Cataclysm is not repeated. 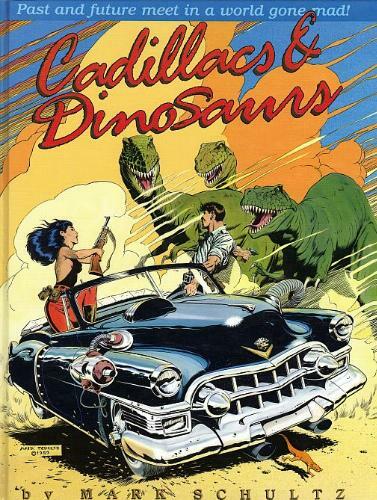 Meanwhile, he and Hannah have multiple adventures in a world that mixes dinosaurs and nitro-fueled 1950s Cadillacs. It’s fun, and more clever than it may sound to you. The back-cover image at top is a perfect example of the mélange of styles and influences in the artwork: fashion photography; cheesecake; academic life studies; art deco; Hollywood movies; Decadent/Symbolist art; adventure comics; Gothic horror… some call it kitsch. And while we are musing over Japan, atomic desolation, meltdowns, and general human evil, you may enjoy this riff on bombs, bombing, and movies. You can follow all the links – have fun.